If you have never driven a day boat, or have very little experience there really is no need to worry. Our friendly, experienced staff will give you all the instruction, facts and practical knowledge that you will need to have a truly lovely day out on the Norfolk Broads. One of the true pleasures of the Broads is that the journey is as much fun as the destination, so even if you’re heading somewhere to have a look and head straight back, it will be time very well spent. However long you choose to spend on your day boat we are sure that you will have a truly fantastic day that will leave you wanting to do it all over again. Your adventure starts from the minute you leave our Wroxham based boatyard. The best way to go is to head down stream, away from the bridge, along the river Bure through the picturesque riverside thatched cottages and impressive waterside homes. 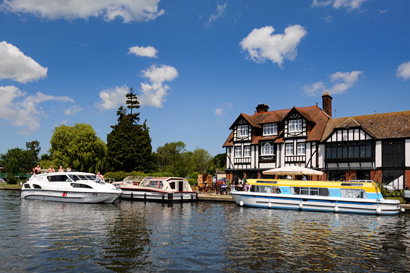 It doesn’t take long to leave the busy hustle and bustle of Wroxham behind you and see why so many visitors return to the Norfolk Broads year after year. As you pass the last thatched house on the right hand side the river widens, lined with rich plant life, willow, birch and alder trees. 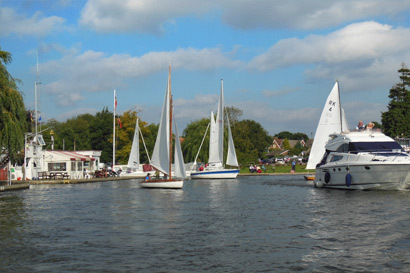 It isn’t long before the entrance to Wroxham Broad is in sight; steer to the right onto the broad, if you are lucky you will be able to enjoy watching one of the many sailing regattas that regularly takes place throughout the year. (Please take extra care to give way to any boat under sail and avoid the mooring buoys) Travel down the broad and exit the broad back onto the river to head back to the boatyard. As you arrive back at the yard one of our staff will greet you and help safely moor you up. When hiring a day boat for half a day it’s a good idea to either pack a picnic or stop for some lunch at one of the many popular riverside pubs. 4 hours out on the water will allow you enough time to either travel up stream to the picturesque village of Coltishall or downstream through the village of Horning and onto Ranworth Broad. Head up stream, under the bridge, your journey starts as you pass under Wroxham Bridge and leave the boatyard behind you. This stretch of river to Coltishall is very calm and tranquil, the tree lined river Bure is rich with a mix of wildlife. Keep your eyes open for the odd darting kingfisher or an otter or two poking its head out of water. It should take you about 1 ¾ to reach the village of Coltishall where there are lots of moorings to tie up to and the village green is an ideal place to enjoy your picnic and to stretch your legs. Alternatively there are a range of riverside pubs to enjoy a quick bite before returning back to your boat to start the adventure back to the boat yard. Head downstream, away from the bridge, through Wroxham and Salhouse on to Horning. This is by far one of the most picturesque villages on the Norfolk Broads offering fantastic thatched waterside properties, fine old cottages, shops, a selection of pubs with river gardens (The Swan, New Inn or The Ferry Inn) and riverside walks. Heading down stream, away from the bridge, to Ranworth Broad is a real adventure. Pass through Wroxham, Salhouse and Horning and then on to Ranworth. The journey will see you navigating through the twisting sailing boats tacking across the river to catch the wind in their sails (please give way to all craft without an engine, if in doubt slow down stop and let them pass) and at every turn spotting a different boat or Broadland bird. After Wroxham Broad is the popular Broad of Salhouse. Its beach like shore means this is popular with wildlife lovers and canoeists offering a safe area for children to let off steam whilst the adults stretch their legs around some of the nature trails. Downstream, just off the main river, you will find the lovely village of Ranworth. This journey won’t leave the crew any time to waste so you’ll need to head back to the boat yard once you’ve enjoyed the stunning view of Ranworth Broad. If you have the boat for 5 or 6 hours, you can visit the Cathedral of the Broads – a lovely old church with steps allowing you to climb the church tower for a truly breathtaking view over the Broads. Why not enjoy a pint in the Maltsters too! If you are looking at hiring a day boat for a full day our day cruisers are the perfect choice, offering a toilet, cooker, fridge, heating and stereo. These craft are a great all weather boat with sliding canopies for the summer months and the cosy seating area in the cooler months. 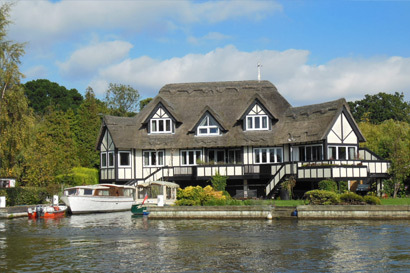 Cast off downstream, away from the bridge, and enjoy the views as you pass through Wroxham, Salhouse, Horning, Ranworth and along to South Walsham. South Walsham is a beautiful Broad with picturesque views seemingly a hundred miles from the rest of the world. Take a picnic and spend time enjoying the scenery, or take a 30 minute walk from the Fleet Dyke moorings to The Ship Inn in South Walsham village. It is well worth the walk. You can even take a stroll around St Benet’s Abbey before you head back to the boat yard. 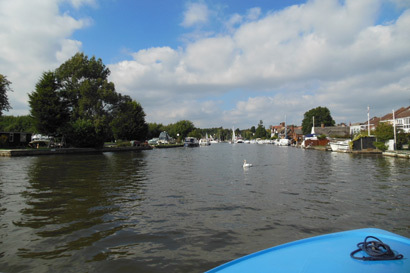 From the boat yard head downstream, away from the bridge, through Wroxham, Salhouse and into Horning for lunch. 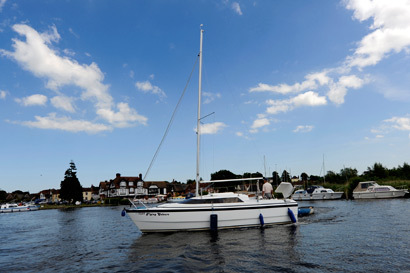 There are lots of pubs in Horning or you could pack a lunch and enjoy it on board at one of the many Horning moorings. After lunch, continue along the River Bure before travelling up the River Ant under Ludham Bridge to How Hill. 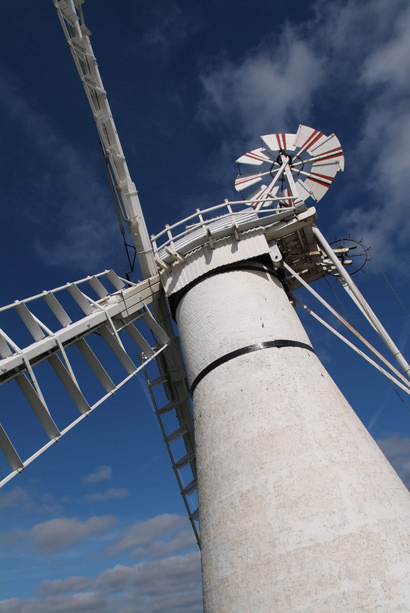 Enjoy the beauty of How Hill, one of the most popular walking locations with our customers, there is also an abundance of Broads wildlife to spot at this peaceful location. 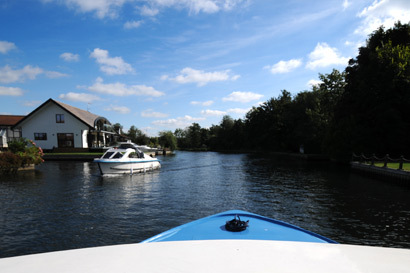 Once you’ve taken everything in, you can enjoy the views of the Broads as you head back upstream to the boat yard. Head downstream from the boat yard, away from the bridge, through Wroxham, Salhouse and Horning and then continue along the River Bure before travelling up the River Ant, under Ludham Bridge and on to How Hill. Take advantage of the best of the Broads with a walk around How Hill and be sure to take a look at Toad Hole Cottage, an eighteenth century marshman’s cottage that used to house a whole family – this will be more of a shock when you see it! You’ll need to have lunch on the way, or on the way back in order to have time for your walk so once you’ve stretched your legs, head back upstream to the boat yard. Please ensure that you keep an eye on the time to ensure that you turn to make the return journey to Wroxham in plenty of time.